"Mexico's Mystery Stone" "Nebula Stone" has only recently been discovered. 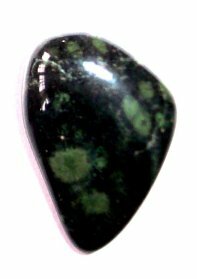 It is a dark green, almost black, shiny stone with fascinating light green, swirling orbicules scattered throughout. This makes the rock resemble the night sky as it appears through a telescope, wherein you can see galaxies, nebulae and individual stars scattered against a dark background - hence the name "Nebula Stone". Nebula Stone is nature's connection from deep within our planet to the far-away nebulae that are the birth of new star systems and the beginning of light. Use Nebula stone as an aid to meditation, for increasing spirituality and connecting with universal spirit, connecting with the cosmos and enhancing one's awareness of being an essential part of the whole universe.